Netflix has published a list of the top Internet service providers in the US based on streaming performance. This is the first time that Netflix has released data of this nature but according to Netflix vice president of content delivery Ken Florance, they will continue to do so on a monthly basis moving forward. 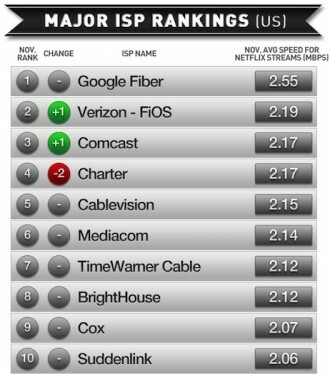 It’s not much of a surprise that Google Fiber ranked first among all other service providers. The ISP was good for an average of 2.55Mbps for streaming content. Verizon’s speedy FiOS network came in second place with an average speed of 2.19Mbps while Comcast finished with the bronze medal at 2.17Mbps. If you’re thinking that these average speeds seem awfully low, you aren’t the only one. After all, Google Fiber is rated at speeds of 1Gbps on the downstream and the upstream. Even Netflix’s own support pages recommend a 5.0Mbps connection for high definition content. Surely something must be amiss, right? Florance further added that the average performance is well below peak performance due to a number of factors like home Wi-Fi, multiple devices being streamed to and several different types of encoding. He said the relative ranking is a more accurate indicator of what consumers can expect from each ISP. Netflix said their 30 million subscribers view roughly 1 billion hours of content each month. Such a wealth of data allows them to produce very reliable information that consumers can use to compare real-world performance across various ISPs.